OXFORD, Miss. – Just when Hunter Gabbard thought things couldn’t possibly get any better, they did. The University of Mississippi physics student participated in an international team of scientists’ discovery of gravitational waves announced in February. Fresh on the heels of that surreal achievement, the Austin, Texas, native learned that he is the recipient of a Fulbright Scholarship to further study gravitational-wave astronomy at the Albert Einstein Institute in Hanover, Germany. “I’m not quite sure ‘pure elation’ is adequate in describing how I felt once I read those first few words in the email, ‘Congratulations, you’re a Fulbright finalist! '” said Gabbard, who is the second UM student to be awarded the prestigious honor this academic year. Maggie Hall also received a Fulbright to Germany this spring. Gabbard proposes to use a novel method-utilizing machine to better characterize and understand the non-astrophysical noise that can mimic gravitational-wave events in the Laser Interferometer Gravitational Wave detectors. He will be supervised by Andrew Lundgren, co-chair of the detector characterization group and part of the LIGO Scientific Collaboration. Previously, Gabbard studied abroad in both the United Kingdom and France. 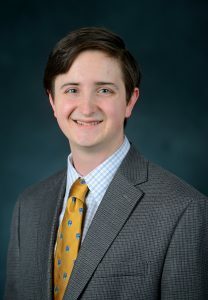 A 2015 Goldwater Scholarship nominee, he is a member of the Sally McDonnell Barksdale Honors College, Omicron Delta Kappa and Sigma Pi Sigma honor societies, and Phi Eta Sigma fraternity. He is active in the Society of Physics Students, Beta Theta Phi fraternity, Phi Mu Epsilon, Alpha Delta Lambda and the Library Ambassadors. Gabbard is most deserving of his Fulbright, UM administrators and professors agree. Douglass Sullivan-Gonzalez, dean of the Honors College, echoed Cavaglia’s sentiments. Bruce Allen, professor and managing director of the Albert Einstein Institute, said Lundgren and other scientists there look forward to Gabbard’s arrival and research contributions. Gabbard said he shares the anticipation for working together with the world’s top physicists. Gabbard’s interest in physics began in high school, but before joining the UM LIGO group he had no idea how scientific research was conducted. After his first exposure to data analysis, Gabbard said he was hooked. During 2014, Gabbard participated in a National Science Foundation IREU program in gravitational physics through the University of Florida. He presented his work at the American Physical Society April Conference a year ago before spending last summer conducting research at the University of Texas at Rio Grande Valley. The son of Lisa and Kurt Gabbard of Doylestown, Pennsylvania, Gabbard is the university’s 16th Fulbright U.S. Student Award winner since 2000. Established in 1946, the Fulbright Program is the flagship international educational exchange program sponsored by the U.S. government and is designed to increase mutual understanding between the people of the United States and the people of other countries. The primary source of funding for the Fulbright Program is an annual appropriation made by the U.S. Congress to the U.S. Department of State, Bureau of Educational and Cultural Affairs. Recipients of Fulbright grants are selected on the basis of academic or professional achievement, as well as demonstrated leadership potential in their fields. Students interested in applying for the Fulbright U.S. Student Award are encouraged to contact the Office of National Scholarship Advisement at onsa@olemiss.edu.